About two years ago , my aunt bought me a juicer . I took it home , unwrapped it and started juicing everything in sight . If it was a vegetable or fruit , it went into that juicer . Nothing was safe from me , not lettuce nor jicama nor green onion . . . . I juiced it all . The thing with juicing is that it can get very expensive . There is a lot of pulp and not very much of juice . If you have a garden , the pulp can be used as fertilizer . Otherwise , your trashcan fills up pretty fast . I didn't mind all of that . I did have a problem with the mess . It seemed a lot of unscrewing parts that needed to be washed and put together again . What a crazy month July turned out to be ! So many events , so many memories . We started off the month with a family friend having back surgery . Back surgery is no joke , it affects every part of your body . Glad to report she is home recovering , although very slowly . The fourth is celebrated every year at my niece's , Kathy . 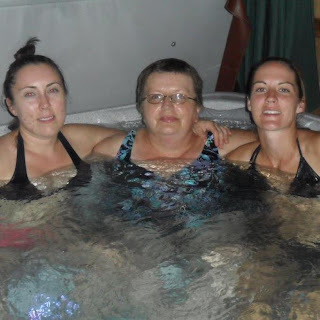 The last two years , I have ended up in the hot tub . Why should this year be any different ? This is a picture from last year with two of my nieces . One of them is expecting a boy next month . Every year in July , my great-niece and nephew from Florida come for a visit . This year we went on a hike that ended with a picnic and what else ? Bowling ! This was also the birth month of my Ministry Club which started with an invite from a friend who wanted a lesson . What did she learn how to make ? A hat for her daughter Sadie . Little Lachlan was baptized . . . . . . It seems that whenever one turns a page in a magazine or clicks through Facebook , there is always a new diet or detox fad . I am hardly a fan and generally when I see a new one , I skip over it without reading . That may seem harsh , but to me , the only healthy way to lose weight is through exercise and eating right . When it pertains to detoxing , people seem to think it's a quick way to lose weight . Even though we may lose weight while doing a detox , keeping it off is another matter altogether . We need to think of detoxing as a way to refresh and cleanse our body from the inside and not as a diet plan . Now , I'm hardly a professional at this , the only time I've done a detox involved eating nothing but grapefruit or drinking tons of just plain water . Since I wanted to create a lifestyle of healthy living , I thought of doing one . These past few days , with Emily away doing her thing , I've been home alone experiencing the life of an empty-nester . I've spent my days wearing close to nothing and totally enjoying the freedom of it ! The house spotless with not even a spoon in the sink , the closest I came to actually cooking was to heat up leftovers . The day she left , the weather changed and I threw open all the windows . Let the curtains billow , baby ! You know , I really love God and I especially love the fact how well He truly knows me . He knows when we need the rest or when we need people to comfort us . He seems to be so attuned to our needs even when we reject His intervention . The words " what if " can certainly pack a punch . They're loaded with all sort of emotion , expectation and rejection . These two words can create an atmosphere of depression within minutes . What if he really doesn't love me ? What if my plan isn't God's plan ? What if they never forgive me ? What if I never become a mother ? What if I'm wasting my time ? What if my time never arrives ? The world is full of " what ifs " . We wait and wait for God to fill our requests , but sometimes , it doesn't quite turn out the way we want it too . Frustration and depression sets in quickly and we keep ourselves isolated from everyone . Sometimes , it's jealousy of what they have and we don't . Other times , anger creeps in and we cry out in pain . Simple Simplicity. . . .
For as long as I can remember , I've always held a dream about my middle - age years . They didn't involve getting cancer nor being in a perpetual state of treatment . My dreams were for a life of simplicity . A time in my life where I wasn't ruled by a time clock or changing diapers . Where I slept as long as I wanted to and I ate whatever I wanted . In my mind , I saw myself living in a small cottage surrounded by a beautiful garden . A cottage far away from city life and city noise . Inside it was furnished comfortably not lavishly . There was a special room used just for crafting with every imaginable material neatly stored away on the numerous shelves . All of that , of course , is just as much a fantasy now as then . In reality , I live in an apartment in the city and I work for a large company . I'm as far away from the country or that garden as I can be . Oh yes , I also have stage three ovarian cancer . There are two levels of speed at our place : fast and slow . Either our calendar is overflowing with activities or we're sitting around watching re-runs of the Simpsons . There is no in-between . We seem to alternate between one month to the next with one being filled and the other lazy . July beats to a very fast tempo . Since so much is going on , there isn't much time to stop and rewind for some " ME " time . Flitting here and there drains my body both physically and mentally . After awhile , I snap and lose control . Since there's little we can do until the calendar slows down , we look for small windows of opportunity for that hour or two of relaxation . It could be something as small as a hot bubble bath or a cup of coffee alone . For the last couple of weeks , this blog has experienced a few dry spells . There have been days where no stories were written to post . I'd sit in front of the computer and stare at the blank screen . No words would form . I've contemplated closing the pages on this blog forever . Has this well run dry ? On the contrary , my brain would overflow with ideas , brimming to the top with nowhere to go . So why couldn't I write ? I'm not sure , but I think it might be time to go to that next level . A time to expand on my ideas , venturing out to further my experience . So what's on the horizon ? After spending countless hours dreaming , I think it's time to get up and actually do something about it . Here are some things that will be coming up in the near future . Reflecting back on my youth , I can still see myself as a person who was ready for anything . You want to work extra hours ? No problem . You want to stay out all night ? Alright . You're looking for a fight ? Let's do it . You want to end this relationship ? Go ahead . I carried myself in the image of a woman determined , poker-faced and unemotional . My emotions were kept hidden from all those around me whether friend or foe . Nothing could touch me . pausing to rest is an act of worship . It's hot and humid around here these days . Any exertion causes one to be drenched in a downpour of salty sweatiness and tiredness sets in easily . Looking out the window , the streets are empty with only a stream of cars passing by . Everyone is inside trying to keep cool during this heat wave . Heat drains our energy . Just the thought of going into work where it's so very hot inside , makes one want to reach for the phone and call in sick . I feel for anyone who works outdoors , in full uniform , facing the elements . As we sit indoors more , isolated from others , our minds wander to dark places better left alone .Things we should have done and words we should have said . Judgments that went array , lifestyles better not lived . Choices . Life . Worries . Doubts . Everyone has a story to tell . No one's life is a completely blank sheet of paper . There is always something written on it . It maybe a beautifully written one with perfect penmanship on a classic text parchment of paper . Or an ineligible scribble hastily penned on any scrap of paper , worn and stained . . . . battered and ripped to pieces . Everyone has a story better not told . A story where pain and misery resided , where hope was seldom seen , let alone thought of . A story part of us , one that has shaped us to whom we are now and yet , we'd like to permanently erase from our history . One that we cringe with shame at the memory of it . their situation to change for the better . Lord , hear us . . .
As a Team Lead , my role involves executing the weekly schedule on the production floor . I spend a lot of time walking and solving whatever issues that may arise to prevent that from happening . Everyday is different and that's what I like the best about my job , it never becomes boring . Once in awhile , usually on a Saturday , I go back to work on the production line , mostly because I am short a person . When I do , the experience truly humbles me . Even though , I started on the production line , it's been many years that I've worked on one on a daily basis . I truly believe we forget what it is like and walking in one 's shoes makes us more aware of what it entails . Perhaps another person is needed ? Or too many people are there already ? Maybe , a better system needs to be developed . Working on a production line from time to time , helps me stay in touch with what it's like to walk in their shoes . When at home , I sit with my feet propped upon a chair . The other day , the sun was shining brightly and a ray came through the window highlighting my feet . My hairy feet . Now , hair is something that I'm not really familiar with since my cancer . I can't even tell you how long it's been since I had to shave my legs , trim my eyebrows or even shave my armpits . I'm not even sure if I have any eyebrows . My moustache ? There's been plenty of hair there . I believe it was in the year 2007 when I last had the lovely experience of shaving period . All of sudden , there's hair on my legs and I mean lots of hair like a monkey . Where did it come from ? Why did it come ? I mean , I'm still taking chemo . Perhaps , this type of chemo actually produces tons of hair . Can you image if that really was a fact ? Everyday , I would have to shave my whole body . Who needs rogaine ? ! I love this stage of my life . My children are grown , my house is clean on a permanent basis and I actually get some real sleep . Who wouldn't feel Blessed with that ? Like all parents with grownup children , I do miss when they were small , but let's be honest folks . . . . it was exhausting ! Whenever I think back to those times where I slept four hours a day and worked sixty hours weekly being both mother and father , well , I'm amazed at my own self . That's why , no matter how tired I may be or how bad of a day I might experience , relaxation is waiting for me at home . I know that and I look forward to it . Having grownup children certainly has it's benefits . I can't tell you how many times I have come home from chemo to a meal waiting for me . There are even times when they actually treat me to a vacation , a movie and dinner out . For a long time now , I have held a secret wish to form a group for women here in my home . This group would consist of fellow crafters who can knit and crochet OR have a desire to learn . 1. to use our talents to serve the community by making assorted items such as blankets for the homeless or baby items for crisis centers etc . 2. to meet and develop a relationship with fellow sisters in Christ . To be there for each other as we live out our lives here on earth serving God . Believe me , I have many reservations . What if no one shows up ? What if they do show up and are disappointed ? Will I be able to physically handle yet another responsibility ? I'm not sure , but I'm willing to give it a try . If I have a party to go to that day or night , my bedroom ends up looking like a disaster area .. . . .chaos everywhere . Lord knows , I try to prepare by mentally dressing myself days before . Somehow , the day of , it never quite works out the same . This past Sunday was no different . Getting ready for a Christening , I reached deep into my closet for that outfit that I planned so well for in my mind a few days ago . Unfortunately , that outfit didn't work as well in reality . As the time drew nearer to leave for the event , the desperation level grew higher and higher . Nothing fit or looked right on me . When a person is between sizes , it's very difficult to find an outfit that fits correctly . Either the shirt fits fine , but the skirt is too tight and so on and on . Real lifeis lived on our knees . Isn't that the truth ! Lately , these words are what I want to live by . All this past week , being off from work , I prayed and prayed as I flitted from one event to another . Prayed that the car wouldn't break down . Prayed that I would arrive to my destination safely . Prayed that my blood pressure wouldn't be too high . Prayed that I could pay my bills on time . Prayed for healing regarding a friend . Praying was the theme . I knew that the next vacation wouldn't happen for a few months . I wanted to get things right to set the tone for those coming months . I felt a new chapter was before me and I wanted to make sure I'd be living the best life God intended for me . A malignant tumor , a disease in which these forms . An evil influence . When we look up the word cancer in the dictionary , we get the above definition , but it means nothing to us . What do you see in your mind when you hear that word ? What pictures form in your head ? If you saw a tumor , would you recognize it as such ? What is cancer to you ? Have you ever seen cancer ? This is cancer . This is my cancer . This is my tumor . My tumor weighed in at 7lbs. I could have had a baby . 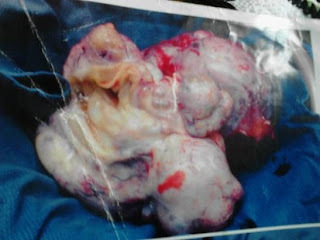 No matter how many times I stare at this picture , I'm still amazed that this thing was inside of me . What formed this ? This is me fighting cancer . This is what I looked like right after my first two surgeries weighing in under 100 lbs . This is what cancer looks like . This is what recovery looks like month by month . and scarves I wore to disguise that I'm sick . A very dear friend of ours , happens to be in Chicago , having back surgery . For the past two days , my mind has been drifting back in time , to my hospital stay six years ago . Back then , the hospital became my home as I went in and out for four months . I can vividly remember that first stay and how uncomfortable I was . I laid there , hooked up to all kinds of machines , tubes sticking out of me . Oh , how I hated that mattress , causing my back to hurt terribly . Every couple of hours , the nurses would turn me , bringing relief for awhile . When I finally adapted to the bed , the powerful light from the hallway would stream into the room , making sleep difficult every time someone entered . When waking in the recovery room , those florescent , glaring lights were the first thing you saw . There is no privacy at the hospital . Not only do you have about ten interns looking down at you during examinations , but your door swings in and out constantly with hospital staff . Even though my blog has been experiencing bouts of writers block , I still have been busy with other things . One of those things happens to be crocheting blankets for the homeless . I have to say , that I really am enjoying making these . They are bright and colorful and I'm not exactly sure if they will like all that flashiness , being used to more subtle and plain blankets . It's hard to believe , but all this yarn has been donated by all of you . Every remnant has been used , no matter how small , it all seemed to come together to form a masterpiece . And to think it all started with one blanket . Just think how many more can be made . Have a Blessed day everyone . The days turned colder and a taste for some homemade soup lingered on , becoming almost an obsession . An idea formed of what I wanted in the soup and I prepared it with an expectation that it would taste heavenly . The final outcome wasn't as good , missing the mark entirely on the seasoning and combination of ingredients . What happened ? I have made this particular soup countless of times with a much tastier result . Why didn't it work this time ? 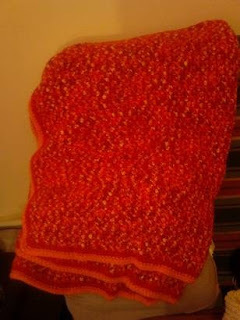 Earlier in the week , I have begun crocheting baby blankets for my niece Kathy's Baby Shower . It has become quite a tradition for me to do so for every baby born in this family . She will be expecting blankets from me , so I settled in with a variety of colors and styles fresh on my mind .